The bunkhouse was the best place we could have stayed because it motivated us to get out and explore. “Let’s get a beer,” I suggested, and we wandered until we found a large open-sided, tin-roofed beer hall from whence a lot of whooping was emanating. I stopped to read the alcohol limits. 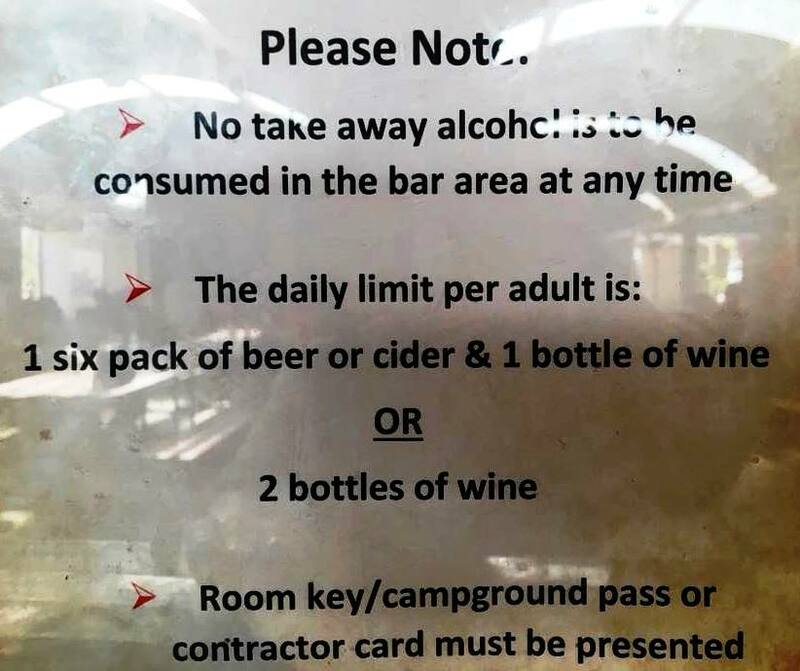 A six pack of beer and a bottle of wine, or two bottles of wine? I would be flat out on the floor before I ever reached those limits. There were multiple bartenders and the place was crowded and rowdy. How could they track who-had-how-much? 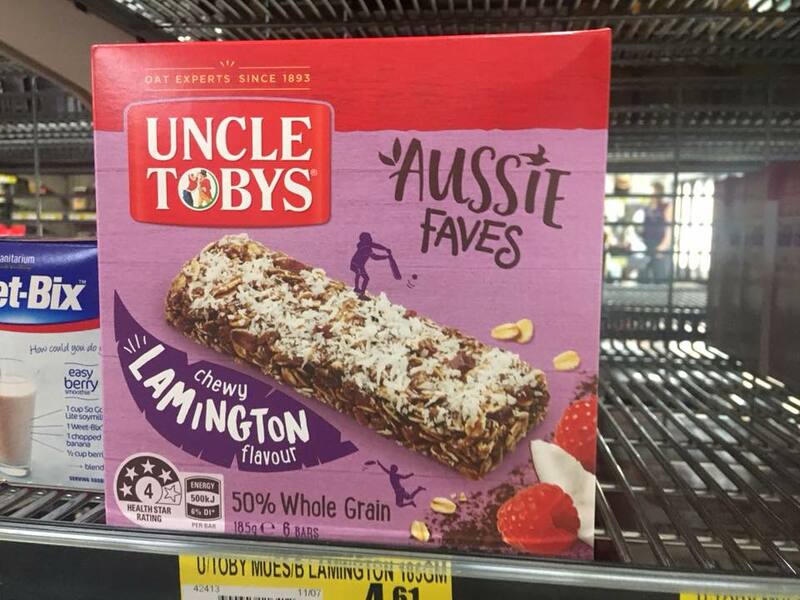 “It’s for the aboriginals,” he said. “To keep them coming in here and getting pissed. I have no idea if this was true or not. I do believe I finally found my sport that day: Australia Rules Football. 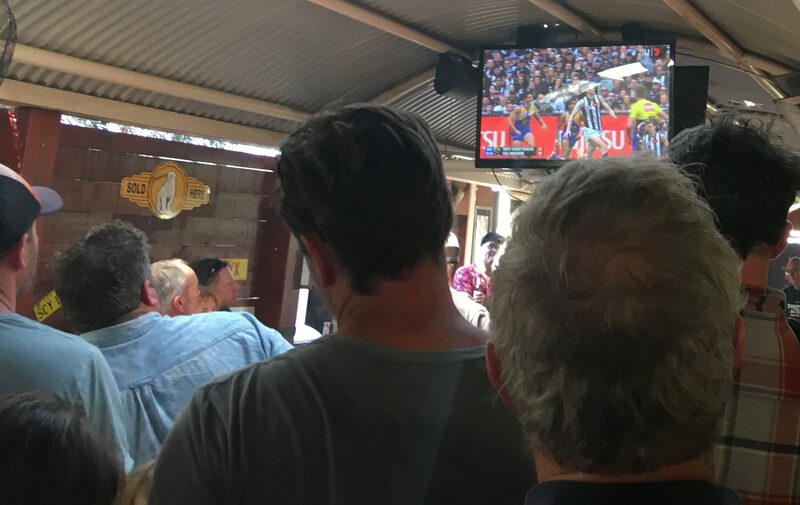 That was the draw today—the AFL Championship game between the West Coast Eagles, based in Perth, and Collingwood, based in Melbourne. I didn’t know what was going on, just that very fit men in what look like wrestling uniforms were running around a round field and kicking, throwing, and bouncing an American-football-like ball and tackling each other. The clock never stopped. The men in the crowd weren’t bad either, if you like tall, rugged men with tattoos. Heidi was ecstatic. She’s a sporty person and she explained the game as we stood in the crowd and watched. “Collingwood is Dean’s team,” she said, as she texted him a message of support. Our friend Dean, who we would stay with in Melbourne in a few weeks. Alas, Dean was destined for heartbreak this day, as the Eagles prevailed over Collingwood in what everyone seemed to agree was a great game. I enjoyed it, to be sure, but I just have no patience for sports. When people start talking about plays and stats and lineups my eyes go dim. At the end the crowd became subdued. 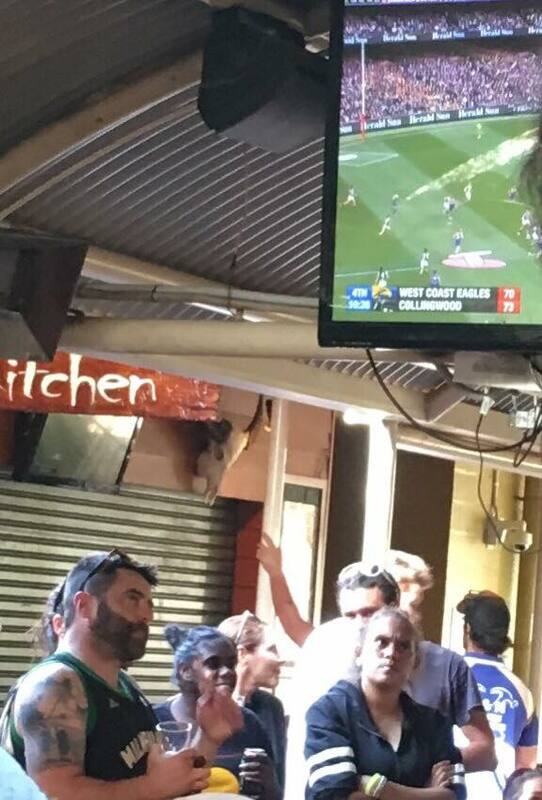 The men in the background, behind Heidi below, were dejected at Collingwood’s loss. More than one man and boy passed me on his way out with tears in his eyes. The winners were also subdued—I didn’t notice any fist pumping or victorious howling. Very civilized. We walked to the “Town Hall” area, which had an IGA (a grocery), a few restaurants, and some stores that sold souvenirs and outdoor gear. 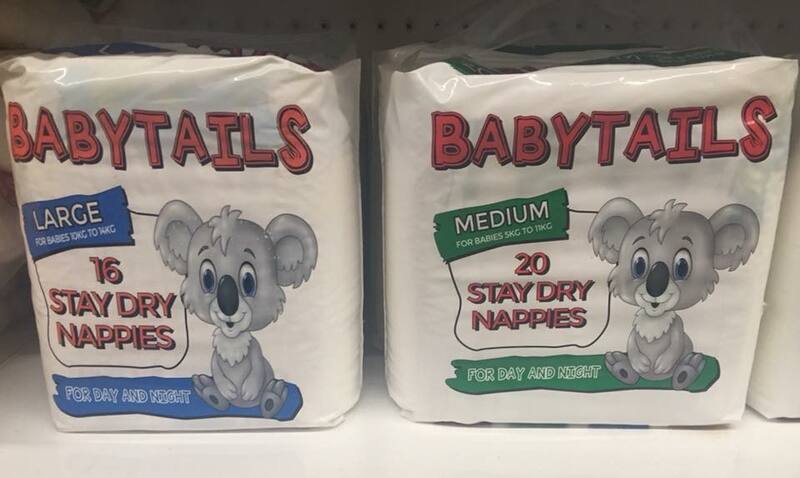 “I’d better get my souvenirs here, since we’ll be camping the rest of the time,” I said to Heidi as I stuffed my shopping basket with aboriginal-art-themed notepads, wacky Australian animal stickers, and a tea towel with kangaroos on it. I bought a hat with a built-in fly net, a decision that would save me from bug-induced insanity while hiking. We took a spin through the IGA and as is my habit when traveling I documented another culture through foods and household goods. 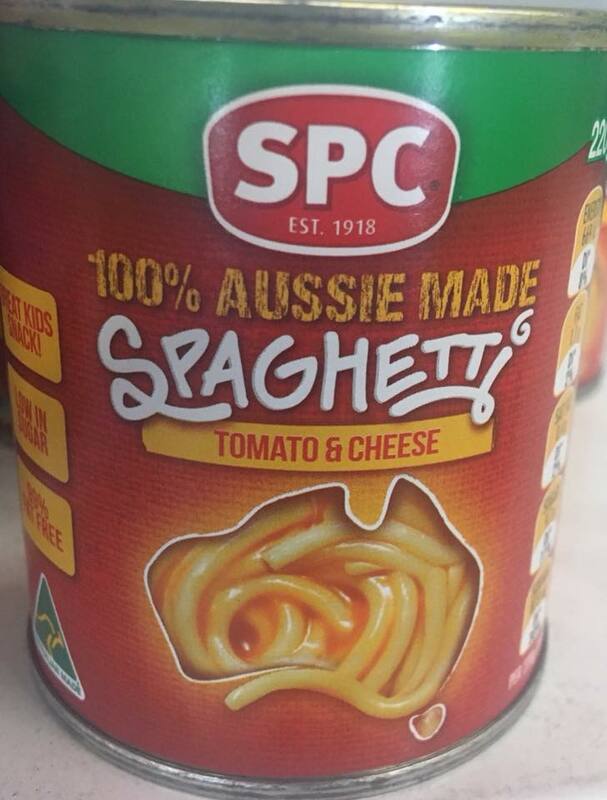 I was not disappointed; there were lots of items with Australian themes. 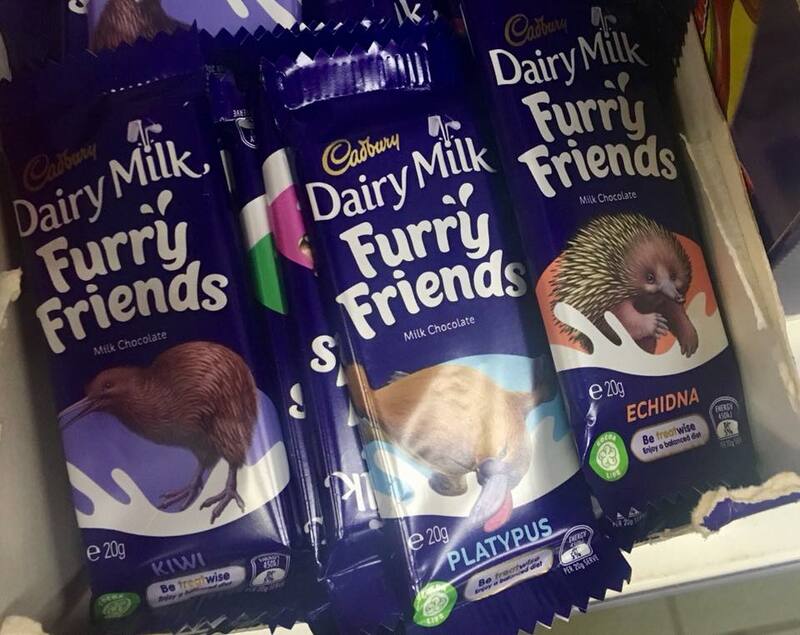 I’m not sure “furry” is an adjective I want applied to candy, but they sure were cute. 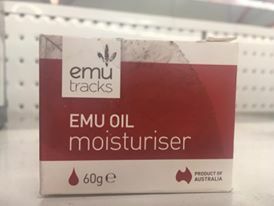 The one box of Emu oil moisturizer looked like it had been there for a decade and had been stepped on by a big dusty boot. 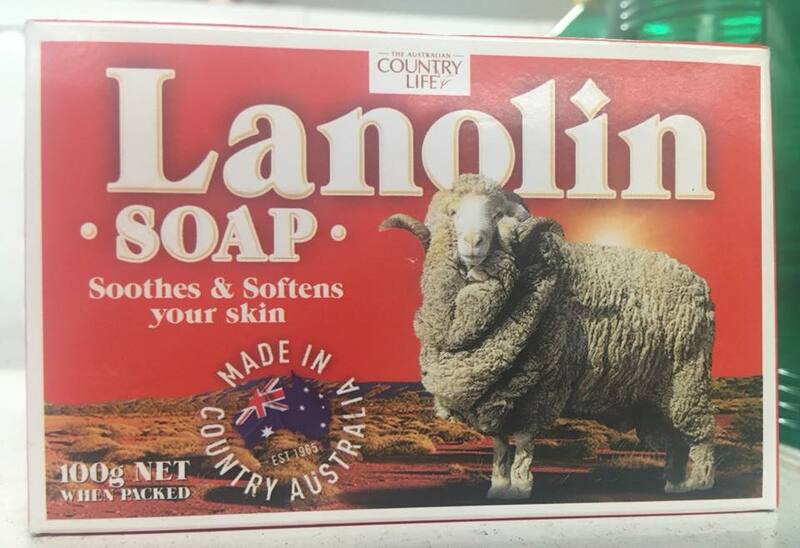 This soap was made in “Country” Australia. Country means rural. 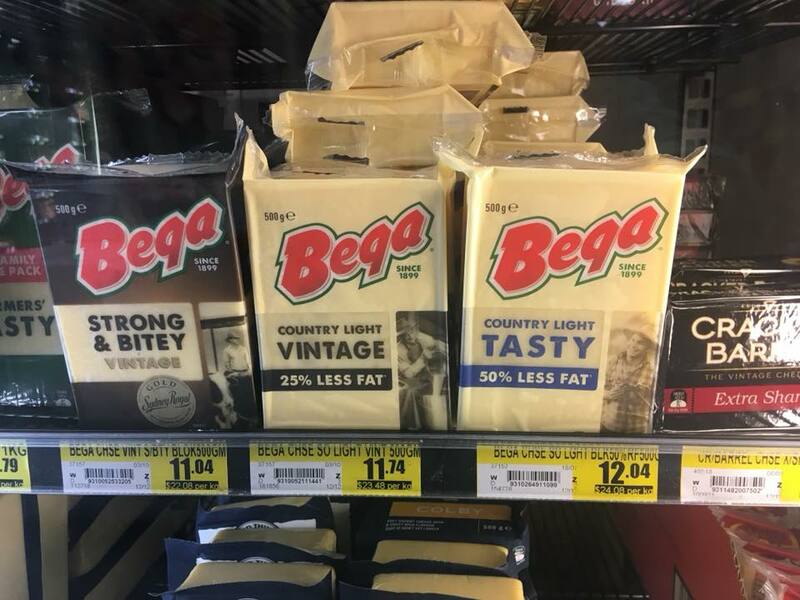 I wanted to buy some Strong and Bitey cheese, especially Bega brand, but we had no refrigeration in the bunk house. 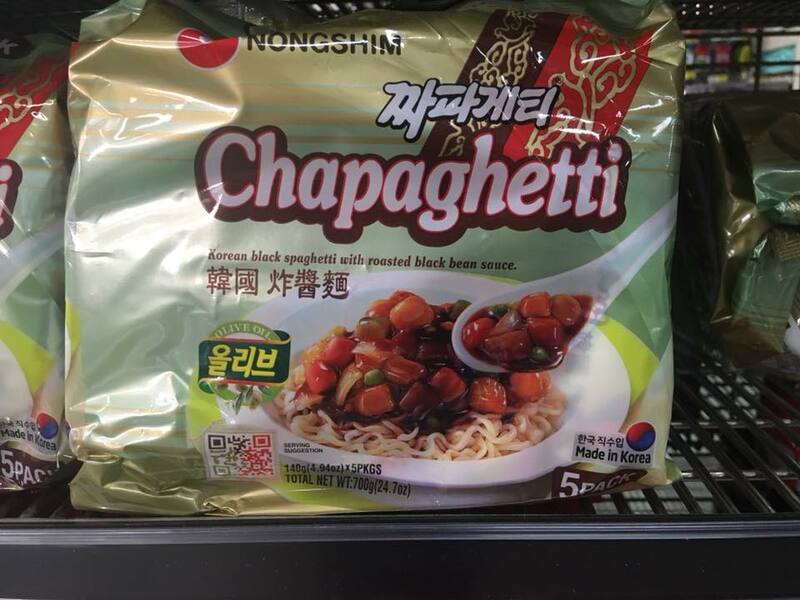 There were lots of Asian imports, like this ramen spaghetti with roasted black bean sauce from Korea. 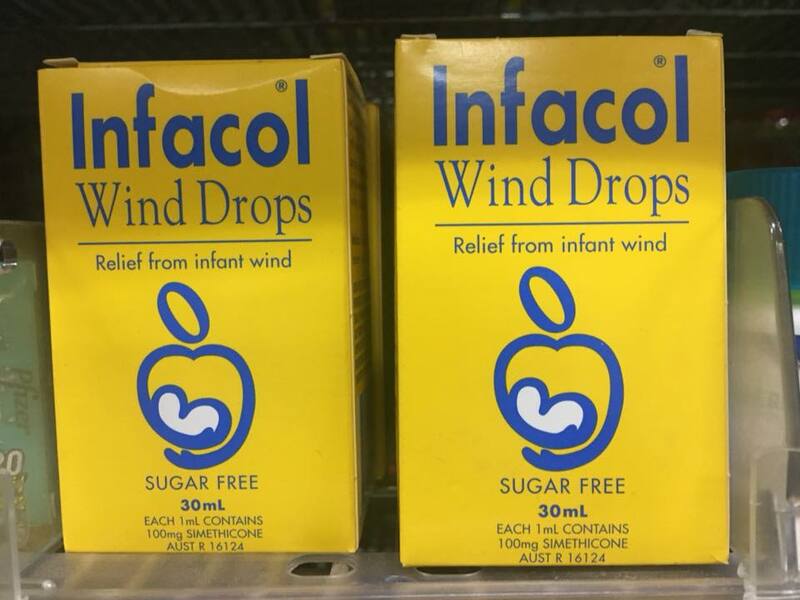 Infant wind drops “provide relief from infant wind.” What a relief. 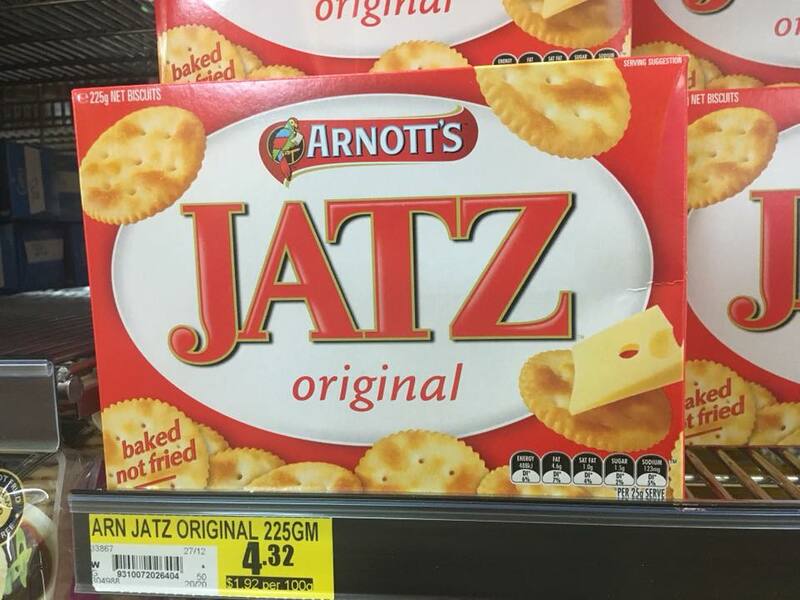 As I would learn, Jatz are the national crackers and people had strong opinions about them. Lamingtons, which are rectangles of day-old chocolate cake with chocolate frosting sprinkled with coconut, are the national—and delicious—cake. 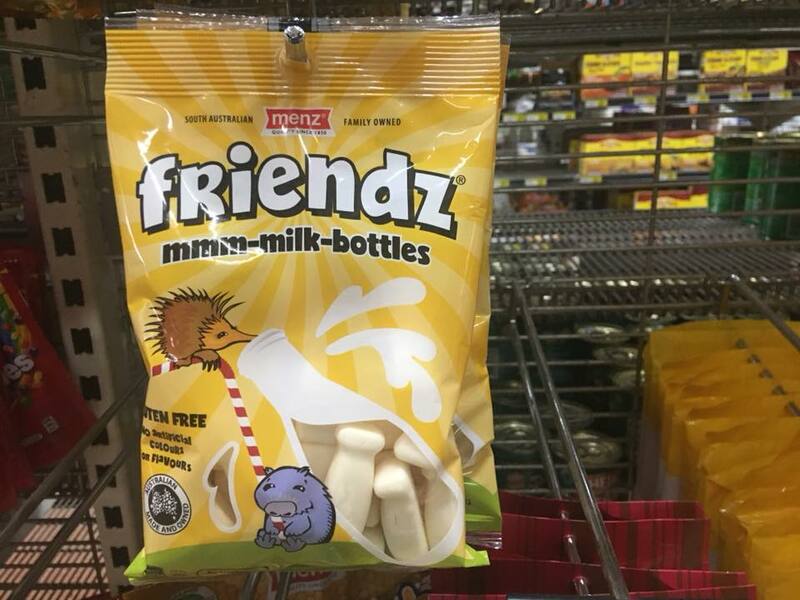 Various mites. 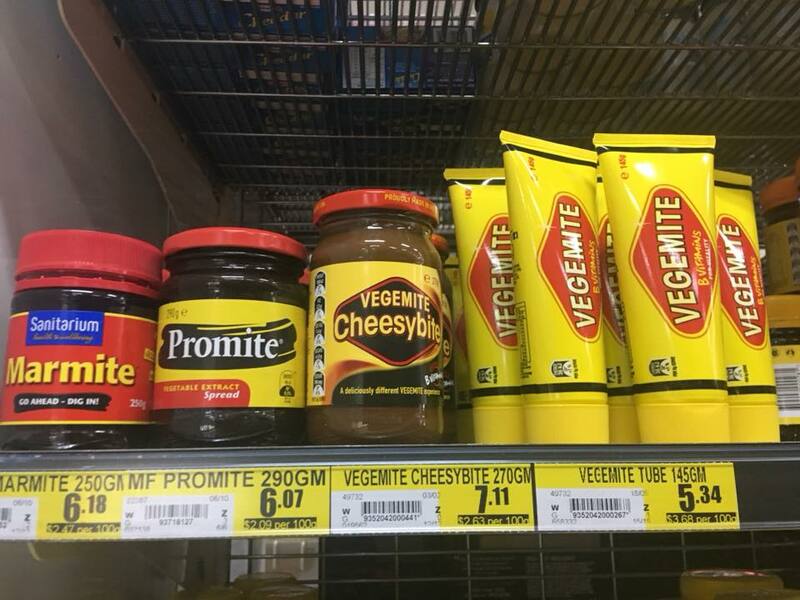 And no, I never did have a vegemite sandwich. 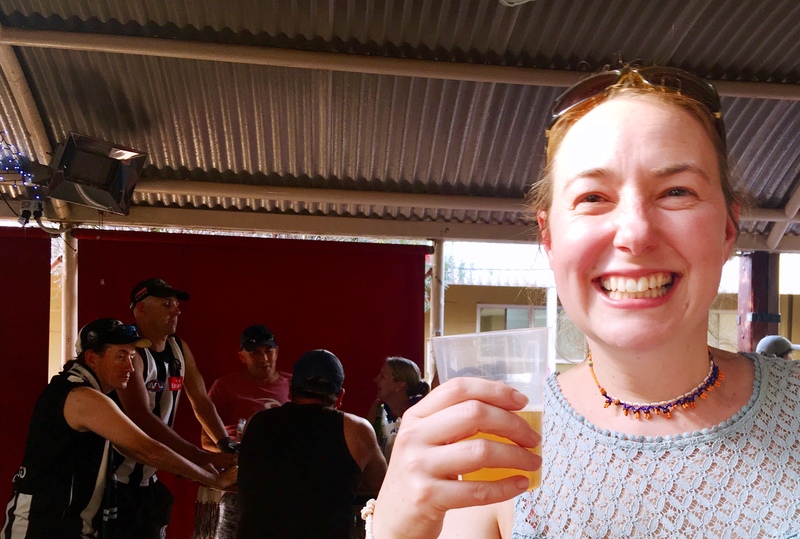 This entry was posted in Adventure, Budget travel, Cooking, Culture shock, Travel and tagged Aussie Rules Football, Australia, Outback, Red Centre, Ularu on November 11, 2018 by Breaking Free.